The US presidential nomination process is a source of anxiety and entertainment for people outside the United States. This year is no exception, particularly with the rise of Donald Trump. While Trump has built an amazingly robust brand that represents, to his fans and supporters, success, straight talk and no-nonsense bias for action, he is also seen by others as arrogant, uninformed and dishonest. Ah, but this blog is about the Olympics. So what’s the angle? In April, 1977, Trump married a Czech model named Ivana Zelníčková in New York City. They met in Montreal at the 1976 Olympic Games, where Ivana was a successful model. Trump was immediately enamored of Ivana, and as was his wont, would boast. “By the age of six, (Ivana) was winning medals, and in 1972 she was an alternate on the Czechoslovakian ski team at the Sapporo Winter Olympics,” wrote Trump in his book Trump: The Art of the Deal. Apparently, he talked about his super model, super athlete wife in this manner countless times. 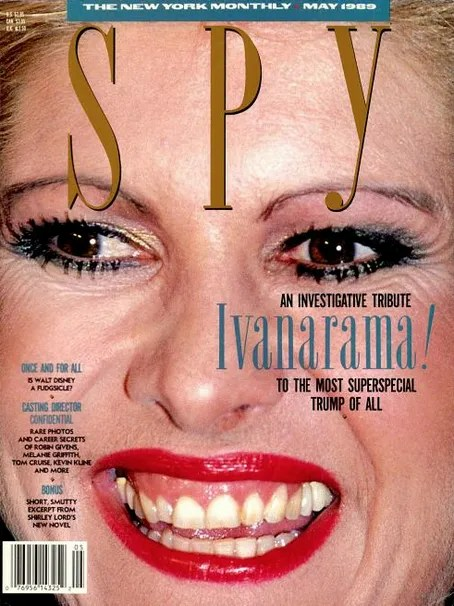 But as written in this profile piece on Ivana in the May, 1989 edition of Spy Magazine, Ivana’s story was a tad embellished by The Don, as she admitted to calling him in the article. Just to be clear, it doesn’t appear that Ivana was saying that she was an alternate on the Czech Olympic squad. Trump was the one waxing poetic about his beautiful bride. Is Trump exuding success or dishonesty? I’ll leave that to you. Posted in Geo-politics, Other Olympics, Others, Winter Sports and tagged 1976 Olympics, Donald Trump, Ivana Trump, Montreal Olympics, Sapporo Winter Olympics, skiing, Spy Magazine. Bookmark the permalink. Say it. It was dishonesty. As is his wont.